Speed is a measurement of how much light is needed to make a usable image on light-sensitive material such as film - in other words, a measure of sensitivity. "Faster" film requires less light, and so can be exposed at a faster shutter speed or smaller aperture. 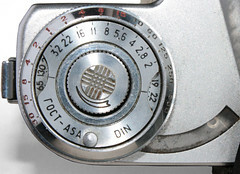 Film speed is represented on a numeric scale; on most scales, the higher the scale number, the less light that is required to expose the film. There are currently two numbering systems in use - ASA/ISO and DIN, but there have been various other predecessors. "Fast" film is more sensitive than average - typically with speeds of above 400 ISO/ASA - permitting photography in low light, or the use of high shutter speeds and small apertures, allowing freezing of motion (and reduced camera shake), or large depths of field. In other words, fast films can result in sharper pictures. "Slow" film - say, speeds below 100 ISO/ASA - can be used for slow shutter speeds - for deliberate blurring of motion, or large apertures to give small depths of field for selective focusing. The speed of a film is specified for a particular, standard method of processing. Using non-standard processing - e.g. changing the development times, temperature, chemical dilution or using different developer chemicals provides the photographer a choice of a range of speeds for any given film. Increasing the speed of film this way is called "pushing"; decreasing the speed of film is known as "pulling". It is common for fast film to have larger grain size and poorer rendering of colours (or grey scale) than slow film. This means that slow film can generally produce higher quality results than fast, but this must be balanced against the motion-stopping and depth of field available from fast films. Varying the development process - such as using a different developer - can also affect the quality and speed in similar ways. With an arithmetic scale, the exposure decreases in direct proportion to an increased speed - so a doubling in film speed requires half the exposure. For example if an exposure of 1/250s at f.8 is required for a 100 ISO film, a 200 ISO film would require either 1/500s at f.8, (or 1/250s at f.11) and 400 ISO film would need 1/1000s at f.8 for the same scene. A logarithmic scale increases a fixed amount for a doubling of speed - 24 DIN is twice as fast as 21 DIN, and 27 DIN is four times as fast as 21. ISO/ASA/BS - current arithmetic scale, defined in standards by the International Standards Organisation (ISO 5800:1977, revised 1987; international), the American Standards Association (ASA PH2.5-1960, American), and British Standards (BS 1380, 1963, British); the newest term, ISO, is now the most commonly used name. DIN - current logarithmic system - defined in the German standard DIN 4512 (1961; defined by the Deutsches Institut für Normung), which was closely copied by the TGL 16150 standard in the DDR (the TGL standard was apparently a couple of years later than the original DIN - the older Neo-Din was still in use in the DDR in 1963); an increase of 3 is a doubling of speed. (21 DIN = 100 ISO/ASA and so 24 DIN = 200 ISO/ASA, 27 DIN = 400 ISO/ASA). The system was introduced in place of the previous so-called Neo-DIN of 1957. DIN (old) - the original system (known as the Alt-DIN today, i.e. Old DIN) was introduced in 1934 and was written as a fraction over 10 with a degree symbol (e.g. 21/10 °). As this system had been intended for separately developed single plates, when the large scale processing by industrial laboratories became common with different film types processed simultaneously in one tank, a new system was created in 1957, known as the Neo-DIN - it was written just with a degree symbol, e.g. 21°. Neo-DIN was superseded by the current 1961 DIN standard (known as the Neu-DIN, i.e. New DIN), which allowed receiving possibly equal contrast of all negatives, what was needed in an automated copying process. To make things more complex, the Neo-DIN was also called DIN (neu) during its validation. GOST (Cyrillic: ????) - a Russian arithmetic system. According to some sources, figures are about 25% larger than ASA/ISO (so 800ASA = ~1000GOST), but others quote the relationship the other way around, GOST is 10% smaller (800ASA = ~720GOST). 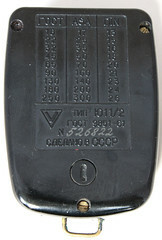 For most purposes, GOST ratings are near enough the same as ASA; this can be borne out by examining a Russian light meter or camera with a built in meter: many mark the same speed scale as GOST and ASA. Hurter & Driffield (H & D) - an obsolete British arithmetic system introduced in 1890. Methods of establishing sensitivity were modified in 1925 (light source) and 1928 (light source, developer and proportional factor - this version is sometimes called H & D 10). The H & D system was accepted as a standard in the USSR until 1951. Scheiner speed - one of the earliest logarithmic systems; there were several slightly different Scheiner scales, such as Europ, American and Ilford. Wellcome - an arithmetic fractional scale used on Wellcome exposure calculators, running inversely to most scales, where 1/48 = 100ASA, and 1/96=200ASA. Weston - an empirical arithmetic system, based on film developing tests, developed by the light-meter manufacturer. There was also a logarithmic (Weston-Scheiner) scale. Some other meter manufacturers had their own speed scales. Lower digital ISOs allow more accurate averaging and less truncation of digital values, and hence lower noise and better image quality. Most consumer cameras use built-in software to reduce the appearance of digital noise at high ISOs, however this can result in images that look smooth but lack detail, especially when enlargements are made. Unlike with film, the ISO rating of a digital camera can be changed on a shot-by-shot basis, allowing the photographer to shoot in a multitude of environments without changing the storage medium. For several years, digital sensors did not have a range of "speeds" approaching those of fast film, at least not without obvious noise, but current (2010) DSLRs are capable of capturing light at higher ISO equivalents. Indeed, high-end models can now shoot effectively and with barely any detectable noise at ISO of 3200 or higher. Some even allow the user to select an ISO equivalent of over 50,000, which is far in excess of famous films made by Kodak, Ilford and Fuji. ↑ Teicher G. (ed. ): Handbuch der Fototechnik; VEB Fotokinoverlag Halle, Halle (Saale), 1963. ↑ Teicher G. (ed. ): Handbuch der Fototechnik; VEB Fotokinoverlag Leipzig, Leipzig, 1974. 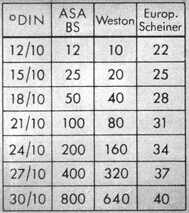 ↑ 4.0 4.1 4.2 Speed comparison table from Newnes Photographers' Pocket Reference Book, published by George Newnes Ltd, London, 1955, shown on Maurice Fisher's Photomemorabilia. This page was last edited on 27 January 2013, at 12:09.